I received a 535 yesterday and was tested it out--while comparing to the 540. I don't really see too much difference except this one has metal sprocket locks with push buttons (vs the plastic ones with no lock buttons). Judging from that and the serial number (535BB 40XXX vs the 540 that is 189XXX) I assume that this one is an older model run. It works fine but the test film I used develops an up and down twitch at a certain point--this seemed to get better after the forum members educated me on cleaning inside the claw area with toothpick. My question is about the worm gear. It looks perfect on this one as well (like the 540). I noticed the 540 had a newer style grease on it (looked like a white teflon type) and this one has the brown grease (but not that much of it). For preventive maintainance, should I clean off the old grease and put a newer safer grease on there? Or is that not important? Thanks! This is supposed to be an Economy model, yet has metal sprocket locks, while the 540 has plastic. My 655 has plastic. Nice looking machine. From what I could gather on Paul Ivester's site, the only difference was this model didn't have a loop restorer. A nice looker. Not much difference between this and the 540, except that the last version of the 540 had a transistor amplifier with a "proper" rotating tone control. As regards grease, if it looks and feels fresh I should leave it as it is. However, if it is somewhat dried and slightly lumpy, clean it all off and reapply. 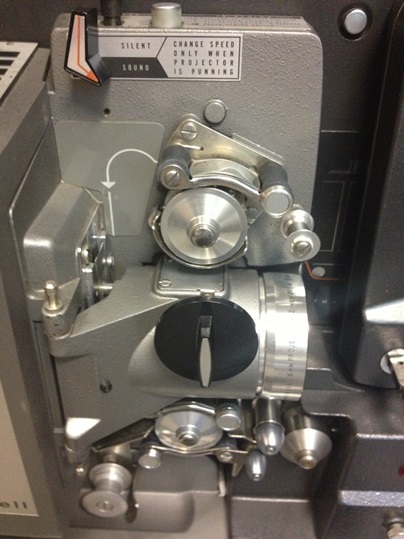 Interesting thing about this valve/tube model vs the 540 is that the exciter lamp is active in forward and reverse! I can actually play the sound backwards--very funny! I'm having a hard time spotting any difference btw the bottom of the transport of this one and the 540 (other than the metal sprockets). 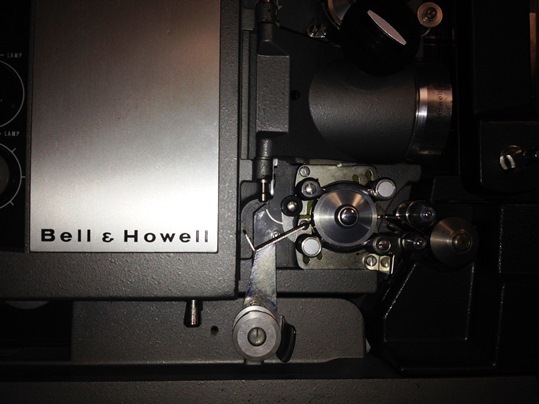 I found that, even though I'm a beginner to this Bell and Howell manual loading that the 535's metal sprocket locks w/ the pushbuttons make it harder to put the tension on the sound drum and lock the sprocket. With no loop former you have more room to form the loop between the gate and the sprocket. 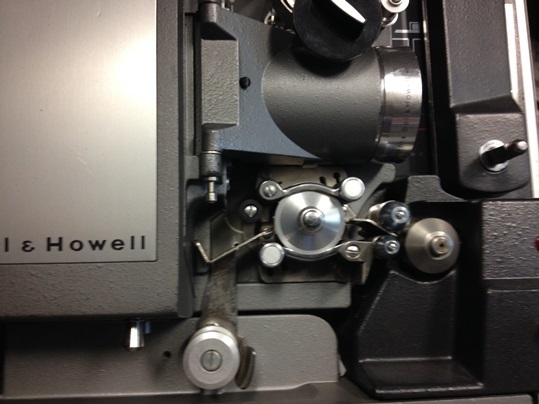 Bell & Howell manual threaders take a bit of using until you get the hang of setting the correct tension around the sound drum. My 535 has a lower loop former. I've never seen one with that online. A skilled friend suggested someone could have modified/added it. Perhaps the claws are out of sync slightly which give you a too tight bottom loop which gently rides on the loop former without actually operating it. 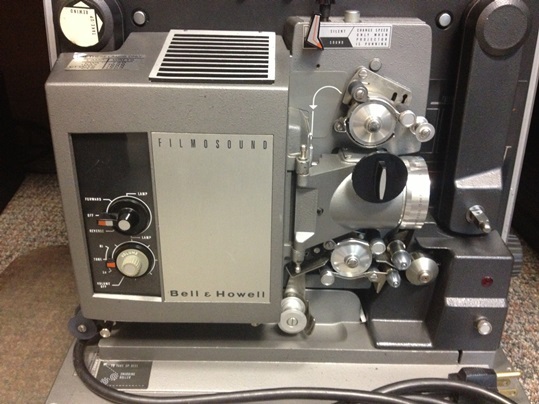 I can't imagine anyone would go to the great trouble of fitting a loop former, perhaps it is just a Bell & Howell update. Try extending the gate springs very slightly. I haven't had the chance to use the B&H 535 in a little while, but plan to extend those gate springs today at lunch. I noticed the the original motor drive belt is beginning to fail. The projector will sometimes slow to silent speed and drag. I noticed that if I stop it, it'll start again at the right speed and slow again. In addition to the gate springs, would a bad motor belt also cause a jumpy picture? I can't see that a bad condition motor belt could cause picture unsteadiness, much more likely to be the claw or the cam.